A couple of months ago, my wife and I returned to our alma mater, Concordia University in Chicago. It was a Saturday afternoon, and the campus was dead. The book store was open, though, and we ended up dropping about $40 there. My find of the day was a thin, pocket-sized book called The Miniature Guide to Critical Thinking Concepts and Tools. You should pick up a copy for yourself here. It’s published by the Foundation for Critical Thinking. In this no-holds-barred, information-flying-at-you-from-everywhere world, critical thinking skills are more important than ever. Without them, we hear only what we want to hear. We hand over our ability to choose wisely to people who mislead us for their own gain or agenda. We cheat ourselves out of becoming as fully developed and as effective as we can be. The foundation is committed to teaching critical thinking skills from kindergarten through college and beyond. It wants everyone to understand at least the rudiments of thought and how they work together to reach valid conclusions and justifiable courses of action. The Miniature Guide can launch you toward a deeper understanding of the do’s and don’ts of thought. It provides an introduction to the standards, elements and intellectual traits needed for effective thinking. 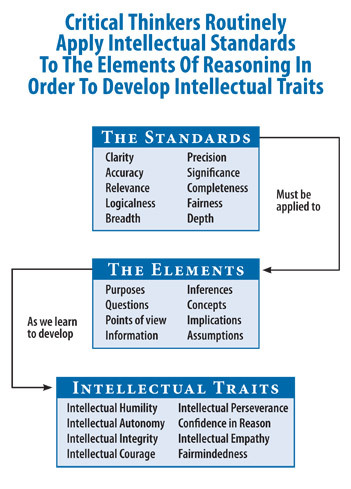 The diagram on the right will give you a better idea of the topics you’ll explore as you start learning how to analyze and evaluate your thinking with the purpose of improving it. If you have kids, critical thinking is one of the great gifts you can give them. If you’re engaged in living (and I hope you are), it’s one of the great gifts you can give yourself. After checking out the book and the organization’s website, I can tell you I have a lot to learn. I hope you’ll sign up and join me in the journey. This entry was posted in Communications, Leadership, Society and tagged critical thinking, logic, thought. Bookmark the permalink.